I went to my first Aqua Aerobics class when I was 12 or 13, and right from the start, I really loved it. The trouble was, being a kid, I had to rely on my parents to get me to the pool because it was quite some distance from where we lived. At most I could get to one class a week. Once I was old enough to drive, I also got a gym membership, surprisingly at a location that was a decent 20 minute drive from home, there was a gym with a pool at Goodwood, I lived nearer to Blackwood. I think they had aqua classes there more often which was why I chose it, plus they had a better selection of on land aerobics and I think, possibly a connection to another gym in Brighton which did a killer step aerobics class. In the water, I am WAY better co-ordinated than I am on land. I have learned over the years how to make the water help me get those steps right. Aqua Aerobics has always been one of my most favourite workouts so it was one of the very first forms of exercise I turned to this year, with my eat less move more goal. I started out with Aqua Lite, just to get back into the swing of things. The one thing I know about Aqua Aerobics is – no matter how hard I push myself, I will not be in pain the next day. In the water I can do things that would simply be impossible on land. I am strong. I did Aqua Lite for a couple of weeks, until I landed in a class with a new instructor who pulled me aside after the class was over and said “Aqua Lite is way too easy for you, you need to come to my High Intensity class on a Wednesday night”. I did not even know such a class existed because it does not appear on the website for the aquatic centre at all, so I was glad she told me. They call it a HIIT class. Even so, I felt like I was not yet ready for high intensity, and did two more Lite classes instead.. then Wednesday appeared and my inner demons (angel?) said.. Go to HIIT. And go I did. I LOVED IT. There is something about that instructor, too. She really pushes me to my limits. I know this because after two weeks of Wednesday HIIT, I went to a HIIT class with a different instructor at way-early-o-clock and it was one of the least effective workouts I have ever done. Depressed after this non-workout on a Monday, I decided to give Aqua Zumba a try on Tuesday. Our local Aqua Zumba instructor is fantastic – she knows everyones faces and so immediately knows when someone is new to the class. She spotted me in the pool and spoke to me, calling over a few other new faces she had seen. She told us a little about the class, checked in to make sure we did not have injuries, and then told us not to worry too much about getting the exact steps right, just to try and follow along and have fun. I have tried Zumba on land, and I was deeply terrible at it. It seemed to me like I was just as bad at it, in the water. But the instructor found me after the class and checked in with me, and I was honest, I said I did not think it was for me because I was pretty bad at it. She said “Just trust me and try one more class, you’ll be surprised”. She told me that each week for four weeks, the music and the steps in the class are exactly the same, then she teaches the class two new routines, which replace two of the other ones for the next four weeks. A week later, I was surprised to find myself packing up my pool bag and heading off to Aqua Zumba again.. and I was even more surprised to find that magically in the space of a week, I somehow became very good at it, and the workout I got seemed to be up there with a HIIT class. The instructor made sure to find me afterwards and ask how it went, and I told her I was glad I had trusted her, because not only did I get a great workout but I had a HUGE amount of fun as well. I said once I knew what the steps were, I was better able to do them. That week, I went to HIIT plus a second Aqua Zumba class as well. 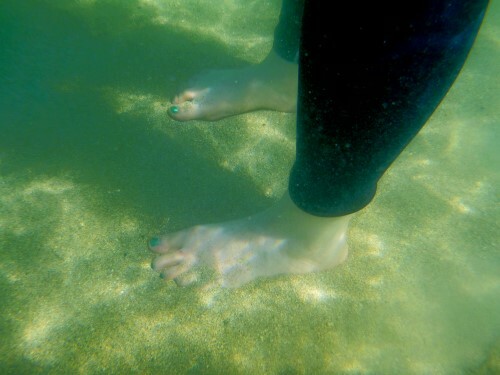 On that occasion I found myself in slightly deeper water than usual, which hampered my steps. So now I know what height the water needs to be at, for me to get the better workout. I also added a new fitness tracker to my stable of tools – the TomTom Cardio Spark, which is able to go in the pool with me as Fitbit cannot do that.. Here is the track from the deeper water Zumba class, which starts around 20 minutes into this track. This workout burned 474 calories and I had a lot of fun! Click for a larger view. The ble arrow is where the class starts. Just to compare, here is an Aqua Lite track – the blue arrows show where the class starts and ends. I did some laps afterwards. It has been 7 weeks since I began this fitness journey. On average I have lost 1 kilo (2.2 pounds) each week. I started out struggling to run for 30 seconds on the treadmill – yesterday out of my 30 minutes on the treadmill, 11 of those were running minutes. I give a lot of credit to the Aqua workouts for this huge improvement in cardio ability. Many people think Aqua Aerobics are lame, something to mock, a workout only for the elderly. They are, quite simply, dead wrong. It has been my personal experience that Aqua Aerobics is one of the better cardio workouts you can do. This post makes me happy! I love swimming and reading about other people doing water-based activities makes me happy too. That sounds like a lot of fun as well as being good exercise – what a bonus! I remember doing Aqua Aerobics with my Grandma once and loved it – if I had the opportunity I would totally do it again. I didn’t know there was such a thing as Aqua Zumba, but it sounds like a lot of fun. It sounds like it is going great–not only for the work out, but for the FUN. You sound happy!! Goodwood pool still has aqua aerobics classes and I thought about going, but getting there and back is just too much trouble. Waiting around at bus stop in the summer heat, then waiting for the tram in the summer heat, getting into the pool and cooling off, then reversing the tram/bus trip to get home again, by which time I was exhausted, hot and sweaty all over again. I taught an aqua aerobics class years back. My “students” were in their 60s, 70s, and 80s. They talked non-stop. I used to tell them if they could talk that much while doing the exercises without losing their breath, they were clearly not working hard enough. They would just laugh and keep on talking. I’m hoping to be able to go to water aerobics once I move. Your success if very encouraging!